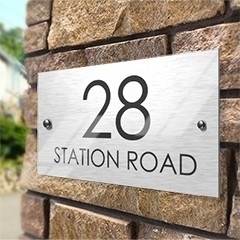 Identify your house or business with a beautifully crafted customised sign. We offer a vast variety of sign options to choose from, each consisting of high-quality weatherproof material. Classic Metal Signs: These signs are made from a high-grade composite metal sandwiched between two 3mm aluminum sheets. Choose between different colours and patterns to match your unique brand or character. We offer two generous lines of text fields to allow you to customise complete addresses or messages. Premium Acrylic Signs: These create a prestigious look for your home or business. Print your custom message on a stunning acrylic plate to make your home or business stand out from the others. 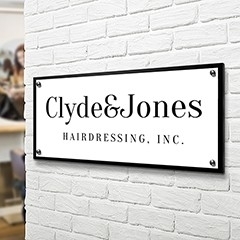 Business Signs: We’ve got business sign styles to suit all business types. Each of our business signs are finely finished with a gloss of UV coating to help keep your custom message looking fresh in all weather condition. 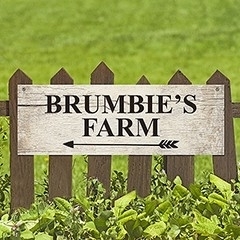 Property Signs: Want to add character to your farm or property? Whether you are looking for a vintage farm feel or a more modern design, we offer a vast variety of options just begging for your custom message. Once the designs have been submitted, you can receive them in one of two ways: Absolutely FREE – Come pick it up from the store, we’ll email you when it’s ready! Mail Delivery – we offer both standard and express delivery options Have the perfect custom design in mind? Start designing today!